Horticulture is more than simply growing plants. Any avid gardener will likely tell you that horticultural activities build self-confidence, encourage perseverance and promote a calm, relaxed environment. It’s these qualities that make the Horticulture Skills Training Program extremely popular amongst the women at the Nova Institution for Women in Truro. 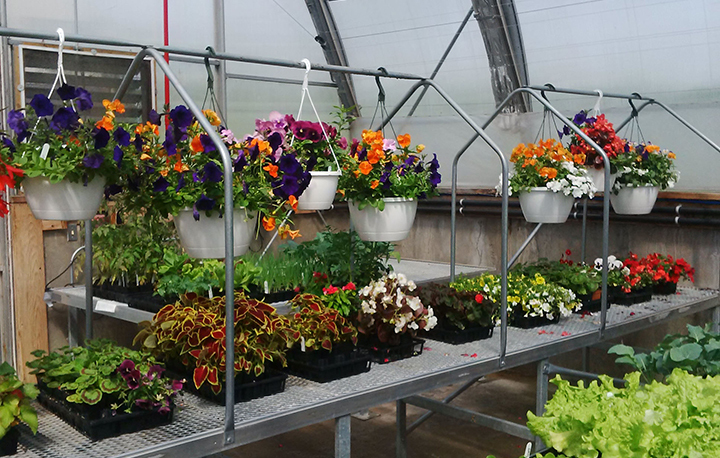 Dalhousie University Faculty of Agriculture (Dal AC) is pleased to once again partner with the Correctional Service of Canada to offer a horticulture skills training program to women at Nova to teach them many horticulture skills that will be useful outside the garden. Located in Truro, the Nova Institution is a multi-level facility that houses minimum and medium-security inmates. It is one of six federal facilities for women across Canada. The Horticultural Skills Training Program teaches women offenders vocational and technical skills to help the transition to employment post-release. The program also promotes and enhances life skills, including self-confidence, healthy habits, and healthy eating. Originally developed in 1995, the program is delivered on site at Nova and facilitated through Extended Learning at the Faculty of Agriculture. Amy Unicomb, Program Facilitator with Extended Learning, will be the new facilitator this year. Bos, who taught the course for 12 years, will provide oversight. The partnership will offer eight courses that cover a variety of topics such as organic vegetable growing, gardening fundamentals, landscaping, and business operation. Four courses are offered per year, with 10 women in each course. The in-depth courses cover an equal mixture of theory and practical hands-on skill training. Participants plant, maintain, and harvest a community vegetable garden, as well as maintain the landscaped areas of the institution. Upon completion of the program, women receive a Dalhousie Certificate of Achievement. This third-party certificate is recognized by employers and the educational opportunity helps to fill gaps in a resume. Along with their certificate, participants will also gain a better understanding of where food comes from and the importance of maintaining a healthy environment for themselves, their children, and society. While the women in the program learn theory and practice of horticulture, their skills are also used to develop and maintain community connections. The women in the program have donated plants to community gardens, food to food banks and have made monetary donations to community fundraisers. Nova has also facilitated work releases into the community and have enlisted the help of community volunteers at the institution. In addition to learning through the course, women have access to a variety of resources to enhance the skills that they learn. The benefits of this program to the women at Nova are evident. While not only learning new skills to transfer into the workforce, participants are learning numerous life skills. The program is designed to receive input from the women, allowing for improved cognitive processes, shared responsibility and decision-making. Feedback from participants has been outstanding. “I felt a sense of achievement and have an awareness that I am a capable woman and have the skills to become anything or anyone that I put my mind to,” says one anonymous participant.